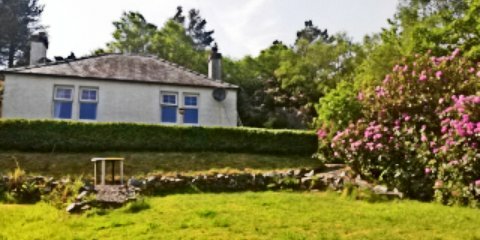 This secluded two bedroom cottage is situated just off the main street of Kyle of Lochalsh, a village on the northwest coast of Scotland. It is at the end of a short but quiet lane and fully secluded by tall thick rhododendron hedges and woodland. Sleeping up to four people, there is a double bedroom with en suite facilities and a twin room with separate toilet and shower room. The living room has a three seat leather sofa and matching leather armchair, an open fire for the evenings, satellite tv and dvd player. There is also a dining area with seating for four people. The kitchen has an electric cooker, washing machine, tumble drier, toaster, kettle, microwave, refrigerator and all usual cooking implements and utensils. 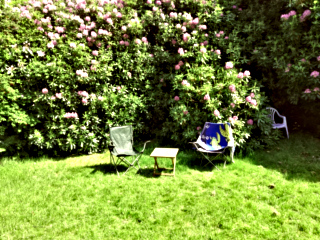 There is the front garden which is secluded and suitable for naturist sunbathing and also the side garden is secluded. The front garden being sheltered by the Rhododendrons can get very warm indeed when the sun is out, even on mild days. 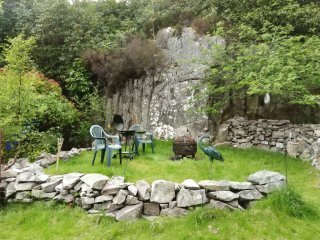 The side of the cottage has a grassy area ringed by stone and sheltered by a rock face which makes it ideal for BBQs, and it also has a fire pit. Also from the side garden it is possible to walk along a path unobserved through the woodland for some distance until the path crosses a fence to a more public area. Although nobody ever seems to use this path it is probably better to take a towel with you just in case! 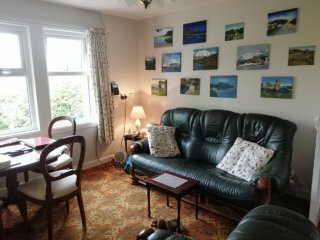 The situation of the cottage within Kyle of Lochalsh makes it idea, not only for shopping, but also for visiting the lovely restaurants in the town and surrounding area, and trying the local fish recipes! Scottish, vegetarian friendly and gluten free options are also catered for. 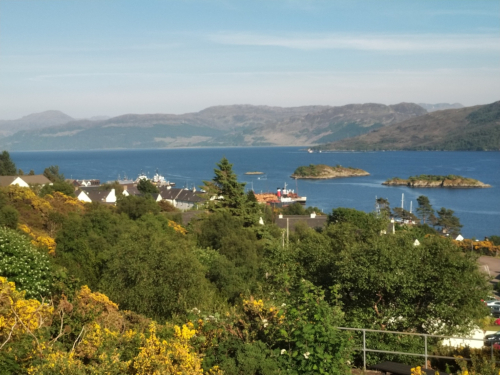 This is a beautiful area for sightseeing and exploring.It is only a five minute drive to the Skye Bridge so makes exploring the beautiful island of Skye very much within reach. Other attractions include Caisteal Maol, a 1400s castle ruins on a hilltop,offering views of the wonderful nearby landscape & loch beyond. 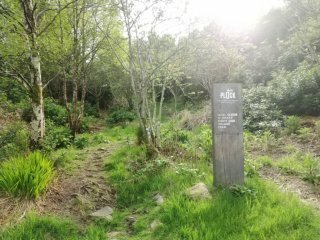 There are also several lovely walks in the area by the nearby lochs, including Loch Alsh, a sea inlet between the isle of Skye in the Inner Hebrides. For further information or details of prices, please contact the owners via the form below. Return from here to the Naturist Holiday Guide home page.